“I love music that swings. I love music which makes the audience dance. I love musicians who have their own personal style and sound. I love the details. I love it as a whole. I love show business! I have tried to collect all of these things in my Swinghouse Orchestra, and together with Morten, Jan, Lennart, Mads and Mads I will spread golden jazz dust over the world! 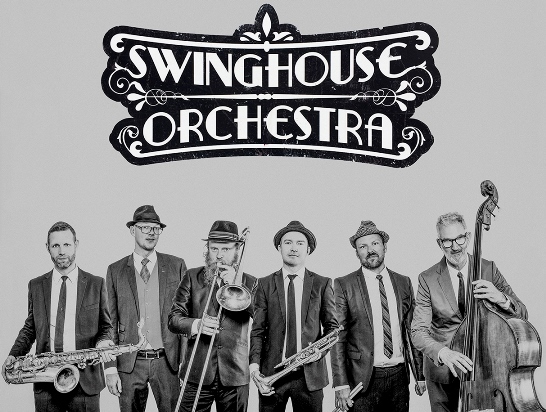 With elegance and swinging rhythms, Swinghouse Orchestra will lead you back to the decadent swing era; where the clubs seethed and sizzled with jazz and dancing! The traditions of jazz music have been given a modern twist and are being catapulted into the future with a new lease of life. Swinghouse Orchestra was created in 2010, in close collaboration with the Copenhagen dance scene, at the legendary venue Copenhagen Jazzhouse. All of the music is arranged by the Danish singer and trumpeter Peter Marott, who has found five of the most remarkable musicians around to join him. The debut album will be released during the Fall of 2017, and is simply called: “Swinghouse Orchestra”.